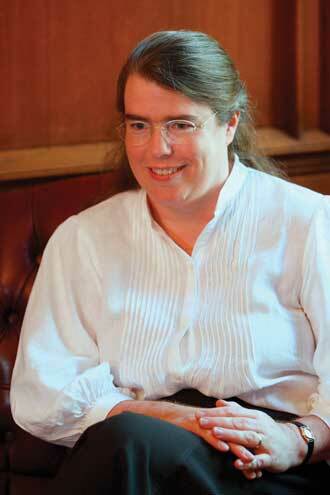 Ellen Aitken is a Harvard-educated theologian and an ordained minister who started teaching in the Faculty of Religious Studies in 2004. In 2007, she was appointed Dean of the Faculty. This year, Aitken will be at the helm as the Faculty celebrates its 60th anniversary with a host of special events. Recently Aitken took time out of her busy schedule to sit down with the McGill Reporter and talk a little about herself and what’s in store for this momentous year. How did you arrive here at McGill? I came to McGill in 2004, after teaching at Harvard Divinity School for six years. My own field is early Christian history and literature, which includes New Testament and covers the development of Christianity in the 1st through 3rd centuries C.E. I’m from Massachusetts, though my father was from Scotland and my mother’s family was from Nova Scotia. So coming to Montreal makes some sense. I came to teach, and became Dean two years ago. You’re also an ordained minister. Yes, I’ve been ordained as an Episcopal priest since 1986. Most people who are ordained are doing parish ministry. They’re very involved in lives of congregations, leading congregations, but a number of us have vocations that take us into teaching or various kinds of leadership roles in other circumstances. For me, it’s been about holding together both an ecclesial identity and an academic identity. Did you always know you would veer towards academia? Yes I did, though I was a full-time parish priest for three years in western Massachusetts, and have always kept an association with the congregation. It was a wonderful, fascinating experience. This was in Holyoke, in western Massachusetts, which had wave after wave of immigrant group. The first was Irish, and then French-Canadian, then Polish, then most recently Puerto Rican. Do you see parallels between your leadership role as Dean and your leadership role as a priest? I do. Many of the capacities and the skills you draw on as a Dean, in terms of listening carefully to a community, coordinating resources and needs, and also having a sense of the horizon and of where we’re going in the future, are things that you draw upon in both kinds of jobs. What were your priorities when you began your term as Dean? I was building on the very strong Deanship of Professor Barry Levy, and I’m very grateful for that and appreciative of his work. My priorities were to help maintain the Faculty, and increase its capacity as one of the leading faculties of religious studies in North America. We are very good at what we do, and that is the critical, analytical, and engaged study of the world’s religious traditions, and understanding those religious traditions as deeply embedded in society – history, culture, politics, you name it. It grows out of a conviction, that I think most if not all of us in the Faculty share, that nearly every area of research and activity in the University has somewhere in it a dimension that is best understood through a set of questions that religious studies scholars ask. If you’re learning to build bridges in the Middle East, for instance, or if you’re going to be a CEO of a corporation that wants to develop factories in India, what do you need to learn about the religious profiles of people who are going to work for you, and what tensions there might be, and how that’s affecting the political environment in which you’re trying to do that entrepreneurship? This year marks the 60th anniversary of the establishment of the Faculty of Religious Studies at McGill. What do you have planned? The event that is probably most focused on the anniversary is a symposium on the legacy of Wilfred Cantwell Smith, which will be held on Nov. 7. Professor Smith was one of the first professors in this Faculty, and he was also the founder of the Institute of Islamic Studies in 1952. In 1949, he delivered a lecture on comparative religion. This wasn’t a big focus of North American academic life at all. So it was a landmark lecture and article, and also landmark in the sense that it identified a key dimension of this faculty’s life – the belief that within the University, there needs to be a place for the academic study of religion that takes all kinds of religions into account. That was a fairly radical idea in 1949. He also had a sense that the way in which you do religious studies involves not only standing outside of religious tradition and looking in, but also taking very seriously the questions and perspectives that arise from the inside of religious tradition. Professor Smith’s legacy is immensely valuable and far-seeing in terms of saying we need other perspectives, or multiple perspectives. And you’re involved with a major conference immediately after that. Yes, our Cantwell Smith symposium happens right before the American Academy of Religion’s International Conference in Montreal Nov. 7-10. About 5,000 religion scholars from around the world will convene. It’s the professional society for religious studies scholars, and they’re meeting in Montreal for the first time. The four Montreal universities convinced the AAR to have a special focus on religion in Quebec at the meeting. We’re also doing a special event on Nov. 8 here in the Birks Building which will focus on the Dead Sea Scrolls and their history in Canada. The Dead Sea Scrolls have a history in Canada? McGill actually owns six tiny, tiny fragments of the Scrolls. That’s the story that lies behind this event. You are also resurrecting a lecture series? Yes, the Centre for Research on Religion Lecture Series on Religion in the Public Square. This is the second series – we last did it in Fall 2007 – and it will run weekly from Oct. 7 until Nov. 18. It’s a very interesting and strong series on religion in public life that my colleague Torrance Kirby has organized. It highlights one of the areas of intellectual priority in the faculty, which is to think about religion’s role in public life, particularly in Canada. In the Canadian context, it’s a matter of how is religion regarded in legal cases, and what kind of space is given in public discourse for religious perspective. Coming from the U.S., it’s one of the greatest points of contrast. There’s more of an assumption in Canada that religion should be private, and that we come into the public sphere without our religious affiliations if we happen to have them. The Birks and Wadsworth lectures are happening around homecoming (Oct. 13-15) and continue this theme around religion, social justice, and questions of religion in society. The Wadsworth lecture is always devoted to the heritage of John Calvin, and this is an important year in that it’s the 500th anniversary of Calvin’s birth. And then there are events around the Dalai Lama’s visit on Oct. 3, which we’re working on together with the Faculty of Education, including a symposium on religion in public education. The Dalai Lama asked that he come to McGill because he wanted to address education students in Quebec. He’s interested in the new religion curriculum in Quebec schools. Apparently, he’s been following it. So what’s the feeling like around the Faculty, with the 60th anniversary and all these festivities? We’re a bit breathless sometimes with everything that’s happening. But there’s a feeling of excitement about the special events, but also about the ongoing research initiatives in the Faculty, and the good steady research and publication that’s happening all the time. The Faculty is really thriving.